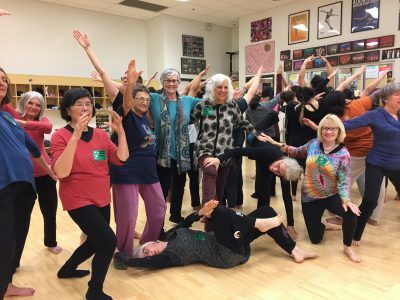 The Impromptu No Tutu Ensemble is a collaborative of dancers age 50-90+ who promote healthy aging and celebrate our lives through creative movement, music, and percussion. We have been the resident dance company of the Albany, CA, Senior Center since 2008. Our mission: To inspire a new view of aging as a crescendo of creativity and community. By freeing the fierce creative dance spirit of older women, we defy all expectations of what dancers up to age 90 can express through committed, risk-taking and mindful movement. We bring this energy into Bay Area communities by offering accessible classes, participatory public events and educational experiences where elder and younger generations can bond and exchange wisdom through the arts of dance and music. Our members form a committed community that sustains us through health crises, family tragedies and national turbulence. We build a healing sanctuary wherever we dance joyfully together. When touring in the community, our speciality is teaching the art of improvisation as a life skill and liberating practice for all ages. Impromptu No Tutu was founded by teaching artist Greacian Goeke to show the world all that dance in later life can be. How collaboration worked: Impromptu No Tutu is a resident project of the City of Albany, CA, Senior Center, which is part of the city's health and human services programs. We have developed a very harmonious relationship over the past 10 years. The project is jointly funded by the City and by participant fees. Details on older people's involvement: This project came into being entirely for the benefit of older people, and continues fully committed in service to their creative interests and needs. The dance ensemble is a collaboration among members and the director. We want to bring the No Tutu spirit to as many elders and young people in surrounding communities as possible, by touring and offering classes and events. We also want to demonstrate and model our practices to inspire other communities to dance with all ages. With funding, we could even imagine attending the WHA in 2020 to show what healthy aging through dance really feels like! This project is ongoing. I would like to be able to get the word out more about our inspirational group and practices that are beneficial to all communities. Low budget; we are still coping with this. We are fundraising for an informational video and travel costs to conferences.